Exciting News! We have upgraded our loyalty program software and are now able to offer even more benefits and discounts. However, the new system requires a simple opt-in process through your email. You will be receiving an email from us to confirm your loyalty program membership, sent to the same email address you have given us in the past. We love being your go-to for all of your pet's food, health, and wellness needs. As our way of saying thank you, we started our Loyalty Program back in 2016. With every purchase at The Pet Beastro, you earn points toward exciting rewards throughout the year. We took all your old points and added them to the new program. In addition, we have added new ways to earn points and more rewards this year! To kick things off and thank you for confirming the new loyalty program, you will receive 50 points just for being you! We're now offering a new Refillable Treat Cup or Catnip Tin reward for ALL of our Loyalty Members for just 50 points. The same points you just earned for signing up! The next time you visit The Pet Beastro, we'll check your account and get you set up with your own Refillable MONTHLY Treat Cup or Cat Nip Tin (only one Cup or Tin per household - you get to pick) and your first month of treats or catnip. Every month after that, just stop in with your Beastro Cup or Tin (must bring your Cup or Tin) and you'll receive a Dog Treat or Catnip Refill for only 1 point! 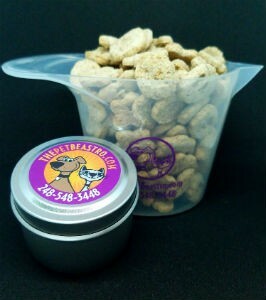 Dog folks will receive a cup of bulk biscuit-style treats every month for only one loyalty program point. Cat folks will receive a refill of organic catnip every month for only one loyalty program point. From month to month, we may offer new treats and catnip blends to fill those cups and tins with, and may even have some fun seasonal options as we head into the year. In addition to using your cup or tin to pick up your free treats every month, you can also use your cup to measure out your pet's food. We will have extra cups available for purchase in case you lose your first free cup or just would love another one to keep at home for measuring food while leaving one in your car for convenience. Just another way to thank you every month for choosing us as your local pet food store. Just confirm your membership and come on by the store to receive your Treat Cup or Catnip Tin during your next visit and roll out with some great goodies for your dog or cat!